Summary : Not the best of lemon teas on the market, that is for sure. While the tea tastes of lemon, it is an odd taste. Review : I'll be truthful. Lemon isn't my worlds favorite fruit. Nor is lemon my favorite additive to water, whether it be in tea or plain old water. Yet, I DO like lemon water and other lemon teas. 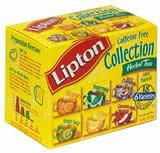 As such, figuring that a lemon tea should more or less taste the same across various product lines of tea, I had rather high hopes for Lipton's Lemon Herbal Tea. And sadly, my hopes were dashed on the rocky shoals of reality. Even right out of the foil package that the tea came wrapped in (as part of a sampler collection), I knew that there was going to be something different about this particular lemon tea. Exactly what I didn't know, nor did I know if that something different would be good or bad. But I knew it would be different - because the aroma of the tea most definitely didn't smell like a typical lemon tea should. The Lemon Herbal Tea from Lipton contains the following ingredients : Hibiscus flowers, rosehips, roasted chicory root, orange peel, lemon grass, lemon peel, citric acid, natural lemon flavor (contains soy lecithin). Like other herbal teas, this one is also caffeine free. Now, there is a taste of lemon in this tea. However, the taste of it is like a lemon I've never had before - and don't really want to again, admittedly. Additionally, this odd lemon taste is also rather weak. This is in stark contrast to Bigelow's Lemon Herbal Tea, another bagged supermarket brand, which has a strikingly strong - and rather pleasant - flavor about it. Recommendation : No. The tea has a weak lemon taste, and the taste of lemon itself is just different - and not necessarily in a good way either. Brewing Instructions : Pour one cup boiling water over tea bag. Let steep for about 4 - 6 minutes. Stash Christmas Eve Herbal Tea : A pleasant cinnamon and spearmint herbal tea that has a weak flavor and little aftertaste. Bigelow Cinnamon Spice Herbal Tea : A moderately strong cinnamon flavored herbal tea that has an ok taste. Culinary Teas Green Yerba Mate Herbal Tea : A somewhat bitter and very grassy herbal tea that tastes somewhat like a bad green tea.